Beitar Jersualem, one of Israel's most popular soccer teams, added two non-Israeli players to its roster this year. Zaur Sadayev and Dzhabrail Kadiyev are both Chechan Muslims and are two of the five non-Israeli players to have ever suited up for Beitar throughout the team's existence. 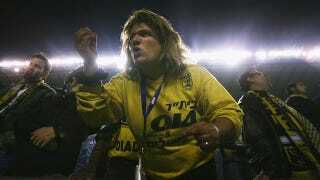 Unsurprisingly, a right-wing segment of Beitar's fan base has not dealt with this development very well. La Familia, a Beitar fan club with an extremist slant, has been very displeased about the arrival of Sadayev and Kadiyev. A sign reading "Beitar is pure forever" was spotted in La Familia's cheering section last month, and three members have been accused of starting a fire at the Beitar offices. Beitar's best player, the Argentinian Dario Fernandez, jumped on Sadayev's shoulders and celebrated with him, but the reaction in the crowd was confused to say the least. In one stand supporters screamed with elation, but behind the goal, in the La Familia end, hundreds walked out. Two members of La Familia explained their decision to boo Sadayev and then to leave the stadium after he scored. "The reaction to the Muslim players being here is not racist," insisted 19-year-old Akeeva, a Beitar fan. "But the club's existence is under threat. Beitar is a symbol for the whole country." Jacob, another fan, agrees, "It's just a matter of being Arab [by which he means Muslim]. It's not racism, they just shouldn't be here. Beitar Jerusalem has always been a clean club, but now it's being destroyed – many of the other players are thinking of leaving because of the Muslim players being here." Solid logic, guys. Now we have to add Israel to the ever-growing list of countries that are home to bigoted shitbag soccer fans.